Bindu is translated as a drop or dot. 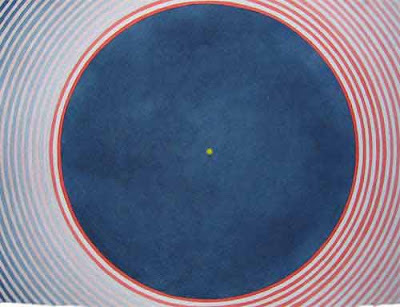 In appearance, it is a dot but in Hindu teachings it represents that which has no limits or boundaries; the timeless – the source of all manifestation. Like many teachings in Hinduism, the concept of Bindu needs to be realized by a devotee. Words cannot fully convey the concept. Bindu has numerous, meanings and definition in Tantrism. It is also equated with the Mother Goddess in certain school of teaching. Thus Bindu is Devi – the eternal source – from which everything appears and in which everything merges. Bindu also denotes the source of the sacred sound – OM – that reverberates across the galaxies. Certain Yantras and other ritual patterns have a Bindu at their center. The significance of it varies from patterns to patterns. For some Bindu represents individual soul. For some Bindu is the infinite on which they can meditate.